Hey everybody. The paperback edition of Keep the Change is coming out on September 6! I will be doing a couple of book signings in the area. The dates and places are listed below. If you can come, I’d love to meet you. Have a nice Labor Day Weekend everyone. ever coming to the west coast of Canada ? Steve, Come down somewhere in SOUTH jersey!! 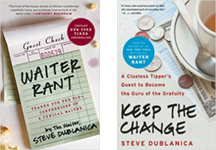 In the process of reading your book “Waiter Rant” and I find it entrancing. I did a short stint as a waitress in a small town, family owned restaurant, but I’ve never come close to the high-brow type waiter jobs in your book/career. It’s been an eye opener. Wanted to let you know, I love reading the book and I will recommend that the public library buys your newest publication. Way to hang in there. Was awesome meeting you and your lovely girlfriend at Barnes and Noble on Friday. Thanks for the chat – keep writing please! Hi Steve. Awesome writing man! Congrats on your new book and sorry to hear about your horrific day on 9-11. Thanks for posting though. I know we can all relate. (Aside from the blog I was wondering if you can you email me back regarding business at jozefrothstein@yahoo.com) Thanks! J.R. I have went to my local barnes and noble twice trying to get your new book and they told me they don’t have it in yet. 🙁 I’m going to try another store, I really want that book!